The First Edition of this book (1999) was greeted by critical acclaim, became a bestseller and was translated into many languages. It proved useful for veterinarians in general practice who may have had limited exposure to the subject of immunology in training to help translate theory into clinical practice. 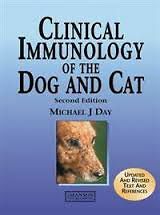 The second edition details the manifestations, diagnosis and treatment of immune-related disease in the dog and cat. It is illustrated throughout in full colour, to show and explain to the reader as clearly as possible the complicated principles of disease and immunodiagnostic tests, supported by clinical cases, gross and histopathology, cytology, haematology, immunohistochemistry and other immunological tests. Since publication of the First Edition many advances have been made and the Second Edition incorporates these changes in focus and on techniques. There is an additional chapter on respiratory and cardiac disease, and given the continued focus of companion animal practitioners on vaccine-related issues, a new chapter is devoted entirely to the subject of vaccinology. The Second Edition includes approximately 200 new photographic images, an updated list of further reading and an extensive glossary of terms. Now in softcover with revised text and references (2012).